Wash the mussels under cold running water to remove any beards and barnacles. Do not scrub the shells as the colour will transfer during cooking giving an unappetising grey colour to the dish. Soak in cold water and discard any mussels that float or remain open when tapped. Melt the butter in a large saucepan, and then add the onion, bay leaves and thyme. Stir then add the wine and bring to a boil. Add the whipping cream and parsley and stir well. No seasoning is required as the mussels will release a little salt water when they open, which is enough to season the dish perfectly. 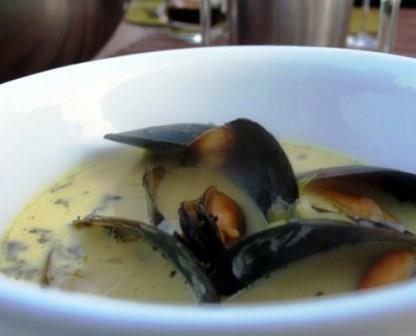 Serve the mussels in a large warmed serving dish or four soup plates.